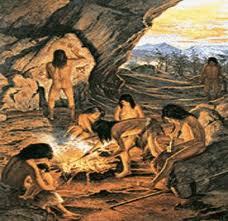 Thousand of years ago people lived in huts made of branches and animal skins. They did not travel very far. They had very feew possessions. Primitive people picked wild plants to eat. They hunted wild animals in the forest. They caught fish in the river. They cooked food over an open fire.